Rent a pet-friendly holiday cottage or house with a swimming pool for happy family holidays where you can take your dogs along to be part of your holiday. Pets should always be pre-arranged when booking, especially if you have several dogs or large breeds of dog. When looking for a holiday cottage with a pool where you can bring your dog, we recommend checking arrangements for dogs before booking. Some properties welcome 1 dog, some 2 and some 3 and occasionally more. If you have more than 1 dog, it is essential to check whether all your dogs can be accommodated. Also important is finding out what facilities are available for your pet. Are water bowls provided or any other helpful facilities for dogs? 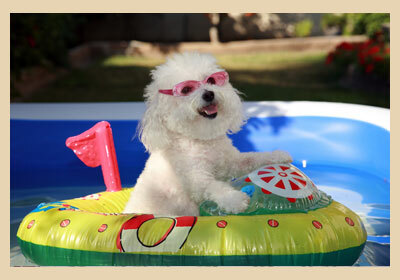 Do ask to make sure that you can plan and have everything you and your pet needs on holiday. Do check for charges. 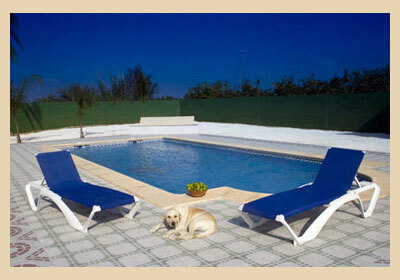 Some cottage agencies and owners make, usually small, charges for dogs whereas at others it is free to bring your dog. Again we recommend calling or email owners or agencies for full information. Do remember as well to let the owner or agency know about you, your party, your dog(s) and your requirements before booking. Some places only accept certain types of dogs so good communication is key to making sure you have a great, trouble free holiday.